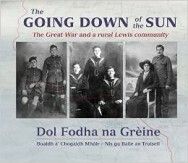 A unique collection of photographs, interviews and writing in both Gaelic and English, this book examines the impact of the First World War on one community. THERE are few events in life which would still be mourned 100 years later — but so deep and sore was the wound inflicted on Lewis by The Great War, that the collective heart is still heavy with loss. As sure as the poppies still grow in Flanders field, the tears still flow at the memory of the hundreds of sons, husbands, fathers and brothers who never came home. 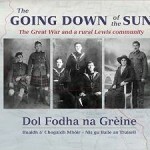 With this being the centenary of the outbreak of hostilities, 2014 has seen many acts of remembrance, but there can be none more moving than a newly-published book on the war, as it affected one island community. The Going Down of the Sun is a beautiful hardback published jointly by Acair and Comunn Eachdraidh Nis (Ness Historical Society), which features a selection of first-hand accounts on the war by local survivors. 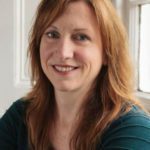 These accounts were transcribed from interviews recorded on tape in the 1970s by the fledgeling historical society and preserved ever since. A wealth of other historical information has been put into the book alongside these precious stories, including a new version of the Roll of Honour and an impressive timeline, which sets out the chronology of the war. Touchingly, this timeline does not just detail the significant events as they played out, including all the victories and defeats in battle and the losses of various ships; it also includes the losses of every individual soldier and seaman. On May 9 in 1915, for example, nine men aged 19 to 31 lost their lives. Most were killed in action in France. The book, written in both English and Gaelic, tells the story of the war experiences of the Ness district from Skigersta to Ballantrushal. But it could be telling the story of any island community. It is alive with the stories of individuals and deserves an instant place in the canon of great literature on this terrible period of human history.